Read my thoughts on BBG Pre Training. 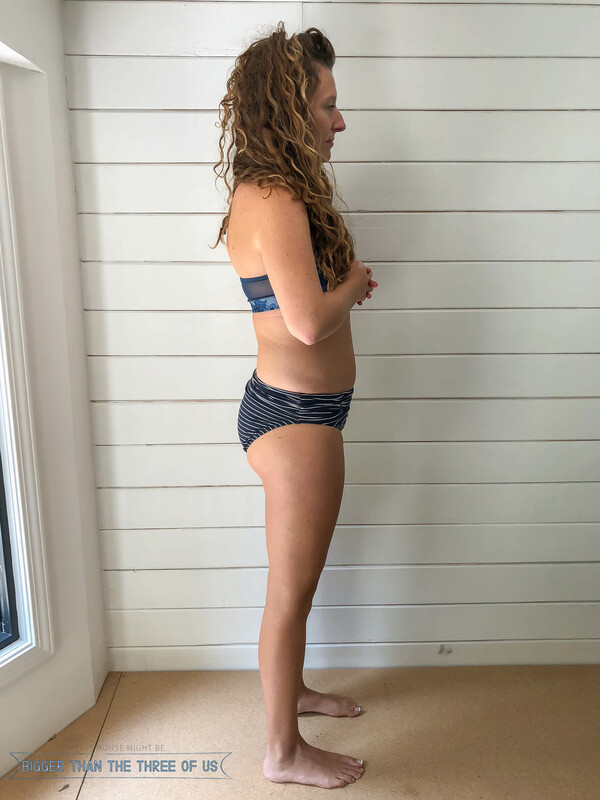 I’m giving you an honest opinion with this BBG Pre Training Review including whether you should do it! I’ve been wanting to share more of our lives with you all in a way that makes sense for us, personally, but also provides value to you (as my reader). Occasionally, you’ll see recipe posts (like my Grandma’s Best-Ever No Knead Bread), a kid-friendly post (like how to add a bucket and pulley to a playset), or a travel post (need some kid-friendly things to do in Madrid?). 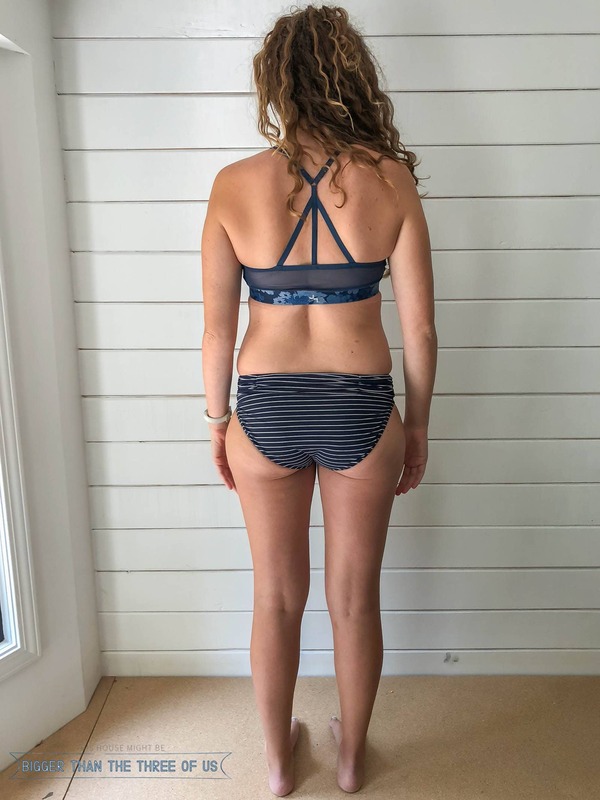 I’ve branched out once in my writing to talk about how my fitness journey was going; specifically, what I do to take care of my low back pain (read that post on core strengthening if you missed it) but I never followed up on that post. Today, I’m sharing my BBG Pre Training Review but I’m pretty intimidated about sharing it. I think I’ve been nervous to share because then I actually have to put up photographs of myself in workout gear. I’m like everyone else and I want to see before and after photos when I’m reading about fitness and workouts. That’s pretty intimidating but I’m working on conquering my fears for you all and I’m sharing it all in this post! Before I get to the BBG Pre Training Review, let me just say that I’m not a newbie to the Kayla Itsines Bikini Beach Body Guide. I did her program about three or four years ago (when you could only buy the program as a paper handout) and finished it once. I had really good results. For some reason, I fell off of doing the program and then I started having low back issues. It’s taken me two years to get the low back pain under control and gone while being able to workout. My workouts haven’t been intense and, to be honest, I’m not sure I can ever do super intense workouts anymore BUT I have been working out. Workouts prior to starting the BBG Pre Training program have been: consistent hour-long walks (on hilly terrain), yoga and some light lunges. That’s it. So, it’s not like I’m a super fit fitness-type person. What is BBG and What is the BBG Pre Training? BBG is a 12 Week program developed by Kayla Itsines. It stands for Bikini Beach Body. In each of the twelve weeks, you have to do a certain amount of LISS (Low Intensity, such as walking), HIIT (High Intensity, such as running) and three resistance sessions (which are the workouts that she puts together for you). You also have recovery sessions to do, such as stretching or yoga. That’s basically the gist of the BBG program. BBG Pre Training is for those of us (me) that needs some extra help to get started. I wanted to be very cautious with my back and glutes, so I definitely wanted to do the whole four weeks of the BBG Pre Training. Pre training is just like her 12 week Bikini Beach Guide but it’s less intense. For example, some of the arm stuff is done on your knees instead of on your feet and toes. Instead of combining mountain climbers with a push up, there’s planks to do for thirty seconds. BBG Pre Training is basically getting you used to the Bikini Beach Guide program in a gentler way than just jumping right into week 1 of the program. Should You Do BBG Pre Training and Is BBG Pre Training Necessary? Yes, you should definitely do BBG Pre Training. Unless you have a very strong core and are used to doing squats, arm workouts and full body moves (such as burpees), I absolutely think BBG Pre Training is necessary. 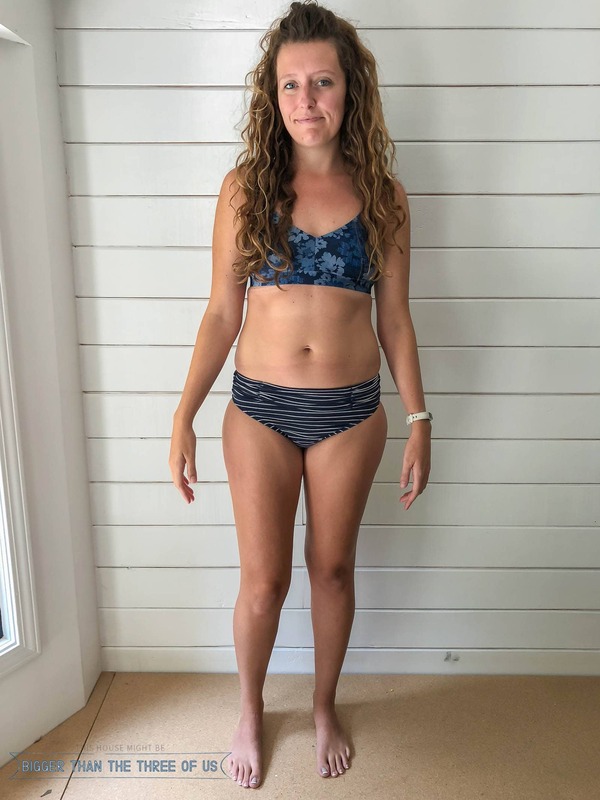 If you really struggle with the pre training, I’d go as far to say that you should consider doing it over again (so, do 8 weeks of it) before starting on the actual 12 weeks of the Bikini Beach Body Guide. *So, I decided to pay for the BBG app, which is AMAZING. It’s a monthly fee and that’s annoying BUT it allows me to do the program anywhere. I can do it while Greyson is swimming outside or I can do it in my office. Before, I just had the printed binder and I’d highly recommend just paying for the app. You can track everything in it. Before I started the pre training week 1, I took pictures. After taking pictures, I started week 1. Week 1 was really hard. I focused (and am still focusing) on doing all the workouts in each resistance set (4 sets of 7 min workouts per resistance workout) properly. During week 1, I definitely didn’t get my heart rate up high enough during each of the resistance workouts because I was focusing on doing the techniques right. I’m ok with that! I finished week 1 with all workouts completed. BBG Pre Training Week 2 was a bit harder. I can’t remember what we had going on but I couldn’t get (or couldn’t motivate myself) to do the arm workout that week. I got all my walking in (I try to get 9K each day) and two of my resistance workouts done. Even missing one of the workouts, I felt pretty good about myself. Pre Training Week 3 had too many arm exercises that were hard. Mountain climbers plus pushups for just one of the workouts is very difficult. I struggled this week with the arms and the legs workout. I had to start modifying this week in general. I’m not using weights or a medicine ball to make things harder, but again, I’m feeling great that I’m not having any low back pain and that I’m actually doing the workouts right! This week, I’m still didn’t use the medicine ball for squat and presses. It’s just too hard. Also, burpees are very difficult when you have hip/back issues. So, I’m doing the burpee sequence but I’m not doing it as one continual movement. I’ve been still staying on track with the walking which is part of the program as well as the stretching so I’m feeling pretty good about that. This was the first time that I’ve used the app and I think it really helped me stay on track during the whole BBG Pre Training Program. At the end of the four weeks, I had missed a few resistance workouts (maybe three total) but am feeling great about what I did accomplish. One of the things that’s not recommended, but I did a few times was to combine a resistance with a low intensity workout in the same day. I didn’t do them back to back in the day, but I did do both in the same day a few times. That allowed me to have an extra “break day” each week so instead of having just one day to take a break, I would take two days. I feel fitter and leaner and am down about three pounds. More than the weight loss, I feel good about where I’m headed. Well, I’m starting the whole 12 weeks of BBG. I’m excited and hoping to stay on track with it. I actually started Monday, so I’m currently in week 1. I hope you got some great information out of this BBG Pre Training Review. I’m sure I missed something though, so if you have any questions about the program, I’d be happy to answer them in the comment section below. This isn’t a sponsored post at all, but I wanted to share my thoughts about the program because I really like it. It’s hard enough to challenge me but easy enough for me to stay on track.